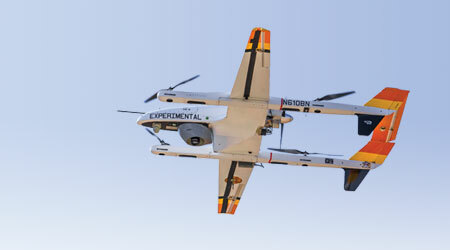 Knox Kershaw Inc.’s KSF 940 Snow Fighter features specially designed wings to move heavy snow in harsh environments. Photo – Knox Kershaw Inc. It happens every spring: North American freight railroads and passenger-rail agencies begin to prepare for the upcoming winter. They review snow removal, switch heater and energy management options, and start to determine what they need to do to ensure they’re prepared, whatever the weather. Witness the Massachusetts Bay Transportation Authority (MBTA) and its commuter-rail operator Keolis Commuter Services. Early this year, MBTA unveiled a series of investments (and a few operational changes) to demonstrate the passenger-rail system was prepared for severe winter weather. The agency purchased 52 new pieces of snow removal equipment, including 10 snow fighters. 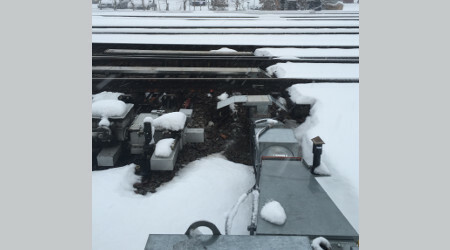 MBTA also outfitted its locomotives with new traction motors designed to withstand the coldest of cold weather. Crews also installed heaters on critical switches. Freight railroads and transit agencies aren't the only ones planning ahead in a weather context. Suppliers, too, prepare to serve railroads that operate in the continent's harshest climates. This month, a sampling of rail industry suppliers share information on products and equipment designed to help railroads contend with the challenges of operating in winter. 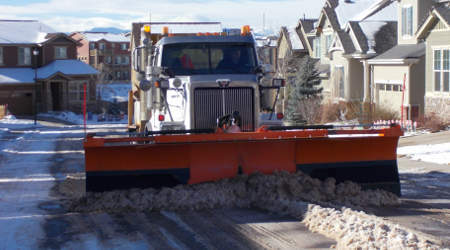 Solutions range from snow fighters and snow plows to switch heaters and idle-reduction systems. Designed to combat heavy snow and to operate in freezing temperatures, Knox Kershaw Inc.'s KSF 940 Snow Fighter has a 50,000-pound working weight and offers a pressurized cab featuring a second operator’s seat and joystick controls. It also includes specially designed wings, a plow and a broom built for moving heavy snow in the harshest environments. The cab has "unique window placement for unsurpassed operator visibility," the company says. The tilt-cab feature provides access to major components, and the side-mounted heater and A/C offer a clean roof line with no maintenance components on the roof. The four-season plow includes a heavy structural frame that can be used for snow or ballast. The bolt-on curl kits allow for plowing through deep of snow — high capacity, 36-inch snow wings clear snow 16 feet from the track center. The broom and auger motor are series driven with individual drives, allowing the snow switch cleaner to blow snow over 20 feet to either side. 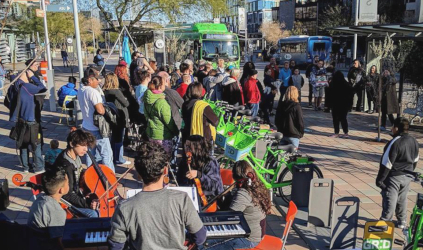 The power unit comes equipped with a 260-horsepower Cummins engine, Espar diesel-fired engine block heater and Arctic Fox hydraulic tank heater. Dual 8-D batteries offer "plenty of cranking power" for cold weather starts, the company says. The KSF 940 also can be converted into a ballast regulator and a brush cutter for year-round use. Power Drives Inc. developed and engineered the PowerHouse, an idle-reduction technology designed to enable a locomotive to shut down in the coldest temperatures. It features a 136,500 BTU/hour (40kW) diesel fired heat exchanger, which provides rapid heating and dependability. The PowerHouse is an idle-reduction technology designed to enable a locomotive to shut down in the coldest temperatures. Photo – Power Drives Inc.
Compliant with EPA Tier 4 emission standards and EPA SmartWay certified, the PowerHouse is available in two design models. Used when locomotives have ready access to 120V (5 amps) shore power, the PowerHouse 120 model is “the only 120 volt plug-in offered in the rail industry,” company officials said. The diesel-powered APU model is a modular, two-piece APU, providing installation flexibility, and is ideal for road haul and run-through locomotives. The APU also includes standard remote monitoring for access to real-time operating data, and charges the locomotive battery bank while the prime mover is shut down. 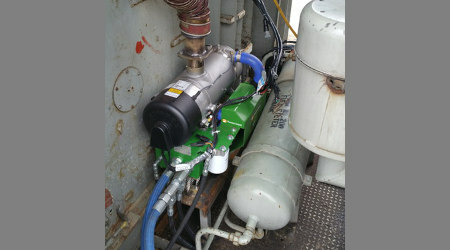 Both models are compact and easy to install on any locomotive, company officials said. In addition, both PowerHouse models include microprocessor controls to automatically start and stop the heat exchanger as necessary to avoid continuous run time, further reducing fuel consumption, emissions and noise. Railway Equipment Co.'s Magnum™ track switch heater product line includes gas hot air blowers, electric hot air blowers, electric rail heaters, fiberglass switch covers and snow detection systems. "Our most recent product advancement to The Magnum product line includes the utilization of an AC drive to reduce power demand during start-up," the company says. "We are also developing a new control module for the track switch heaters that will be backward compatible with current units." Railway Equipment Co.'s MagnumTM track switch heater line includes gas hot air blowers, electric hot air blowers, electric rail heaters, fiberglass switch covers and snow detection systems. Designed to handle the harsh railroad environment, the new control module will feature better resistance to lightning strikes and more robust push-button controls, the company says. 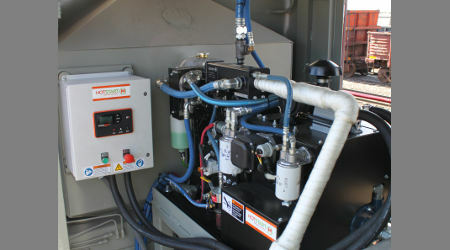 Railway Equipment Co. also offers remote monitoring on The Magnum product line. The Sno-NET® remote monitoring system allows users access to switch heater controls via a web browser, enabling personnel to make real-time, proactive decisions. The Sno-NET system communicates via a cellular modem to a railroad-specific server accessible by railroad personnel. Custom notifications are sent to the appropriate people when an intervention is needed to ensure switch reliability. 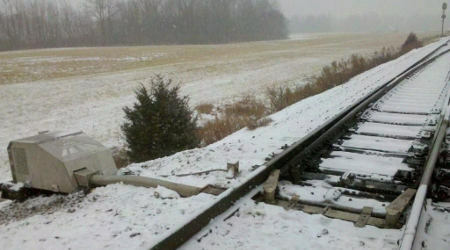 "Our remote monitoring system also retrofits to units and allows railroads to increase the reliability of track switches during winter events," the company says. The Sno-NET product line also features an application that enables railroads to monitor and control switch heaters via smartphones or tablets. Spectrum Inc. offers a line of electric track switch heaters, each optimized for a specific purpose. Spectrum Inc. offers a line of electric switch heaters, each optimized for a specific purpose. Suited for ice and snow removal, the low-profile Spectrum RRSH Electric Hot/Cold Air Blower has been used for decades throughout the United States and Canada, the company says. It features a robust design and aluminum construction, and is easy to install next to the track. The company’s flat rail heater features a flat profile designed to provide greater contact with the rail, significantly improving thermal transfer, the company says. Meanwhile, Spectrum's crib heater is designed to sit between the ties and keep the switch machine control rods free of ice and snow. Its low profile design makes it easy to install, and its water-tight seal ensures proper operation in ice and snow, the company says. Flink Co. offers a variety of snowplows and salt spreaders, including the FXP, or "Flink Expandable Plow," which can expand from 11 feet to 17 feet, giving operators "the ability to safely and legally travel from site to site," the company says. 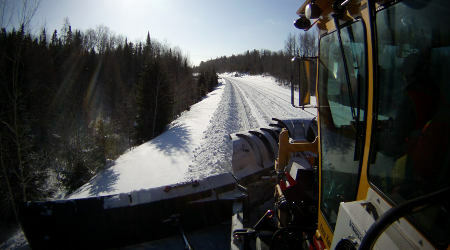 Depending on the size of the job, an operator can control the plow with the pull of a lever; the plow can expand to three feet to the left or right, giving the operator "total control," the company says. The plow, which also can be expanded or retracted to the desired length, is "placed out and in front of the truck," making it easier to control, and for better visibility, the company says, adding that it recommends a minimum front-axle gross vehicle weight of 20,000 pounds. Flink Co.’s FXP (Flink Expandable Plow) can expand from 11 to 17 feet. "Whether it is the small city street, the large parking lot, or the four-lane highway, the Flink Expandable Plow can be used virtually anywhere, giving the driver ultimate control of the road and all obstacles Mother Nature brings," the company says. Engine idle times increase during cold winter weather. For railroads that depend on their locomotives to start whatever the temperature is, idling has become "the go-to method to ensure startability," officials at HOTSTART say, noting that cutting back on idling time reduces fuel usage. HOTSTART’s layover heaters are designed to keep the prime mover of a locomotive heated about 100 degress Fahrenheit. HOTSTART layover heaters are designed to keep the prime mover of a locomotive heated above 100 degrees Fahrenheit, enabling a locomotive to restart easily in the coldest conditions, the company says. The diesel-fired APU heater circulates heated coolant/water through the engine, compressor, expansion tank and oil cooler, keeping the entire water system warm during shutdowns. The shore-powered single or dual fluid heating systems are “complete heaters that warm and circulate coolant or both coolant and oil without any diesel fuel consumed” when locomotives return to the yard, the company says.